On March 30 Fayez al Serraj the UN-appointed Prime Minister of Libya, finally docked in the port of Tripoli from his retreat in Tunisia. However he is hamstrung by numerous internal opposition forces whose artillery prevented his arrival by air. Despite this he solemnly declared that his Executive "will work to unite Libyans and reduce the suffering of the people both in terms of security and economic wellbeing." "It is time" – he said – "to work as Libyans for Libya, turning the page on yesterday and looking to the future with a spirit of tolerance and trust in Allah, because revenge and hatred do not build anything." Despite al Serraj’s reassuring words, "nothing" that might change the situation in Libya has yet happened, compared with the "lot" that has already been done to overthrow the Gaddafi regime and the "great deal" that must be done to meet the ravenous appetites of the local and international imperialists. In 2011, on the initiative of Sarkozy's France and with the support of Britain, the forty-year dictatorship of the Colonel bloodily fell under the imperialist assault from Paris. The then French President, mimicking the behaviour of US President Bush, called for military intervention in Libya, in the name of fighting dictatorship, (we should not forget that it was the start of the “Arab Spring”), to show the Arab world how to reconquer its destiny, that France was no longer the old colonial power to distrust but a nation that fought against oppression to help restore confidence and democracy to those people who for decades had borne the brunt of a ferocious one-man dictatorship that finally, was about to be overthrown. It was a sort of democratic nostalgia exported and adapted to the chaotic state of North Africa. Obviously, there was not a shred of truth in any of it. French imperialism had three objectives in overthrowing the Gaddafi regime. The redistribution of Libya’s huge energy reserves in order to penalise ENI (the Italian state oil company) in favour of France’s TOTAL-FINA. Before his fall, Gaddafi guaranteed about 40% of Libya’s exports to Italy and only 22% to France. Sarkozy hoped to turn these percentages round, making France the privileged country at Italy’s expense. The French Government was afraid that Gaddafi’s threat to create a North African bond, guaranteed by the gold and financial reserves of Tripoli in competition with the African Franc (CFA), imposed on 14 countries in the region by France to facilitate its financial and commercial operations, could become a reality. If this had happened, for Sarkozy it would be a resounding defeat at a time, moreover, when his popularity was at its lowest level. With a pro-French, or, at least, more friendly, Libyan government France would have had a stronger platform from which to launch its ambitious imperialist programme. This is to control and "administer" an area ranging from Sudan to Nigeria through all the countries of the Sahel, in economic, commercial and financial competition with China. The latter has penetrated the region for years now, exploiting its mineral wealth, oil, and investing hundreds of millions of dollars in infrastructure. Gaddafi's regime fell, but things have not turned out as French imperialism hoped. Chaos has engulfed Libya, and the various factions have battled in a kind of war of all against all for control of the only wealth, oil, and its transport routes, and to be the only "legal" exporters to overseas consumers. After five years the situation is, to say the least, depressing. Hundreds of thousands are dead, entire cities have been destroyed, the economy has been reduced to a minimum, with oil exports falling by 90%. There are two governments, one in Tripoli, representing local and international jihadism, and another in Tobruk internationally recognised but as inefficient, if not more so, than its rival. Dozens of tribes sell themselves to the highest bidder, swapping allegiances every time the opportunity arises. The attempts to create a government of "national unity", with a President accepted by both parties, is still-born, as is the formation of a parliament that brings together the economic and political interests of all the warring factions. What's more, it also gives the Islamic State, which is suffering significant losses in its conquered territories in Iraq, the chance to acquire land in Libya and intensify its terrorist activities in Europe. IS has settled 6000 men in the coastal strip of Sirte, exactly halfway between the two competing governments in Libya. It is offering a thousand dollars a month to every desperate recruit from the Sahel and playing its remaining card of building of an al Baghdadi version of the Caliphate there. Meanwhile, international imperialism is waiting for things to be less confusing, even though Italy, France and England are working behind the scenes to hold on to what little they have and to prepare the ground for new initiatives. Paris and Rome have been able to secure the supply of a little oil thanks to their funding of various local tribes, which guarantees them a minimum of wriggle-room in the oil territories. In addition they hire mercenaries to guard their facilities day and night and, not least, bankroll criminal gangs so they don’t blackmail the oil companies and leave them to work in relative peace. Paris and London, whilst waiting for better times, have already sent in military technical experts and intelligence services operatives to monitor the inclinations of the various sections of the local bourgeoisie and to influence current government decisions, as well as the next one to come along, if it ever does see the light of day, and can arise from the depths of destruction and the massacres into which imperialism has thrown the post-Gaddafi Libya. In the meantime the chaos continues. Although the UN has chosen the new President in the person of al Serraj, the two parliaments continue to ignore each other. In Tobruk, in Cyrenaica (in Eastern Libya), the government, until recently recognised by “the international community”, was the one which emerged victorious from the 2014 elections. It is headed by Prime Minister Abdullah al Thinni, who certainly does not see eye to eye with the new UN-backed President. In Tripoli in the West, there is a government that represents the Islamist militias. The political coalition that is in power is called "Libyan Dawn", headed by Khalifa Ghwell. Tripoli, the old capital, is under their control and has the same negative attitude as Tobruk to al Serraj, whose arrival was “welcomed” with the sound of mortar fire. Between the two the forces of the Islamic State hold the Sirte area. General Haftar (a former Gaddafi, general who later became an opponent of the Colonel, and for years found sanctuary in the USA), was supported until now by Washington. He favours Tobruk against Tripoli and against the militias of the Islamic State, waging a personal war which revealed his ambitions to become the al Sisi of Libya. He has taken the international organisations’ imposition of al Serraj badly. The brigades of Misrata sway between the two poles although, lately, have carried out attacks on Tripoli’s troops, and at the last minute have expressed their willingness to support the Government of al Serraj. The most important Bedouin tribes threaten retaliation and interference in any future partition processes. They are demanding their own political territory and access to oil revenue. Added to that there is heavy outside pressure. Egypt, Saudi Arabia and the United Arab Emirates support the Tobruk government. Qatar and Turkey, long-term backers of the Muslim Brotherhood, support the jihadist government in Tripoli. They are all Sunnis, but each with their own economic, financial and strategic interests aimed at hegemony in the area. This has become more vital as the international crisis and the drastic decline in crude oil prices exacerbate tensions. In this welter of conflicting interests it is not difficult to see that the government of the President-designate will not have an easy time. Consequently, Plan B, which provides for the tripartite division of Libya if things do not work out in the "right way", has been planned for some time by the US in collaboration with Italy, France and Britain. 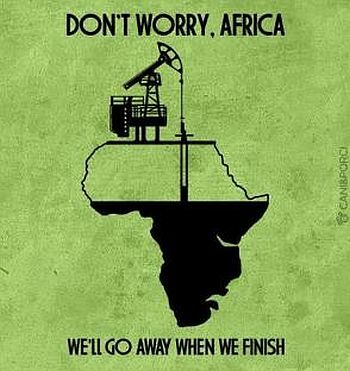 Western imperialism is thus ready to get it out of the drawer when needed. According to this plan, Tripolitania would come under "Italian administration", whilst Cyrenaica would be British-run and France would have the Fezzan. All this presupposes the continuation of political chaos in Libya, plus the failure of the al Serraj government, making armed intervention for the "stabilisation" of this land, destabilised by previous imperialist interventions, inevitable. Obviously, if some compliant government (perhaps even that of al Serraj) asked for outside intervention in the name of the pacification of the country, and why not, to fight the militias of the Black Caliph of al Baghdadi – continuing the Syrian farce where all claim to be fighting against the common enemy, the infamous Daesh, but in reality hiding their real aims of robbery, manoeuvres, strategic conquests and getting their hands on oil revenues – it would be great encouragement for putting plan B. into action. Everything would turn on the "right" line favoured by European imperialism with the approval of the US. Italy, or rather its oil company ENI, would control the Western oil terminals, the Eastern ones would go to Britain. France would get the least rewarding area in the South, but in return, would have the opportunity to exploit the "rare earth" deposits and to keep an eye on the sub-Saharan countries in competition, as previously said, with the awkward presence of the Chinese. For Italy it would be an opportunity to continue as an important partner on Libyan soil both for oil and the volume of business there. Before the fall of the Colonel, the value of trade amounted to 11 billion euros with over 200 Italian companies doing business there. The hope for a tattered Italian imperialism would be to replicate previous conditions, if not improve on them by taking advantage of the business of post-war reconstruction. For Britain it would be an opportunity not just to get their hands on oil, but also enable it to re-enter North Africa from where it has been absent since the time of the Suez Canal crisis. Meanwhile, waiting for the miraculous "solutions" of al Serraj, France and Britain have already sent their military observers to the scene and Italy’s Renzi, in anticipation of future military needs, has allowed the Sigonella military base to be used for sending drones into Libyan territory at the request of outgoing US President Obama. Drones which will fly the American flag on their backs and the Italian tricolour on their bellies. A legacy of the French Empire in Africa the CFA was established in 1945 and today is fixed at 656 to the euro. It is supposed to ensure stability in the 14 countries (12 ex-French colonies plus the former Portuguese colony of Guinea Bissau and the ex-Spanish colony of Equatorial Guinea) that use it but in fact makes them subordinate to European decision-making.